A beautiful smile can be a valuable tool. Whether you’re leading a big presentation at work or simply meeting friends for a night on the town, perfectly white, straight teeth showcase all kinds of positive attributes to those around you, including confidence, youth, vitality, success, and much more. But what can you do if you weren’t blessed with a naturally flawless appearance? The last thing professional adults want is to spend multiple years suffering with traditional metal braces. Here at Boston Smile Center in Brookline, we’re happy to share some good news with you: you don’t have to! Dr. Alan Sasson offers Invisalign as an adult orthodontics option that simplifies the straightening process and keeps it practically unnoticeable, allowing you to correct your smile without having to sacrifice your self-confidence in the process! It’s simple enough – a set of clear aligners will be specifically created for you by the Invisalign lab, with each one representing a different stage of your teeth as they move into their ideal alignment. All you have to do is wear each one for the appropriate amount of time before moving to the next in the series. With a brief check-up every four to six weeks so that we can ensure that you’re making progress, you’ll have a beautifully straight smile before you know! 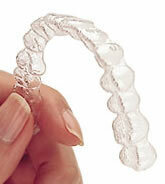 Invisalign has countless benefits over traditional orthodontic methods. They’re clear and removable, meaning that you won’t have to make any inconvenient changes to your diet or oral hygiene routine. Better yet, most Invisalign cases are finished after only 12 to 18 months, which is a significantly briefer treatment time than the multiple years metal braces usually require. Contact our Brookline office today to schedule a FREE consultation with Dr. Sasson. We’ll be sure to leave your teeth feeling happier and healthier than ever before!